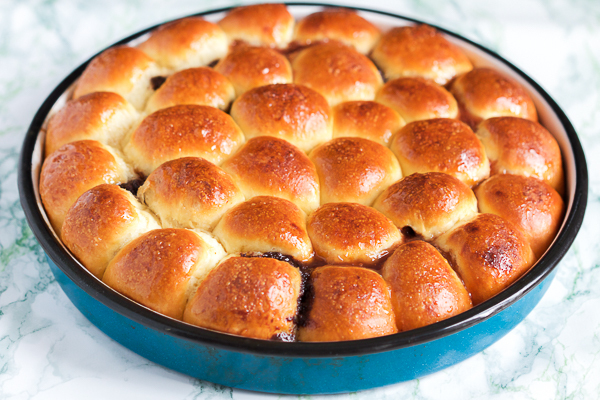 Marmalade rolls: just the right thing for a perfectly sweet and juicy end of the day. I’ll keep it short today. We are making marmalade rolls. Soft, smooth, comforting. A perfect, light dinner along with your favorite tea. I say dinner because, in the Balkans, lunch is the largest meal of the day. So the warm, juicy rolls are the most perfect way to finish the day off. Preparation and ingredients are very similar to the Nutella rolls we made a few weeks ago. Except this time, we’ll use marmalade or jam to stuff them. There is something about sweet preserves (check out BLB’s orange jam) making them the perfect pairing with the milk based dough. Each bite melts in your mouth. They’re a perfect TV binge food. I admit, I like to eat them a few at a time, wrapped up in a blanket with my favorite show on. Mix yeast and sugar in warm water until incorporated. Leave aside for 10-15 minutes. It will start to bubble up when ready to use. In a large mixing bowl, combine flour, 2 eggs, salt, oil and the yeast mix. Start adding warm milk as you mix the flour until it becomes dough. 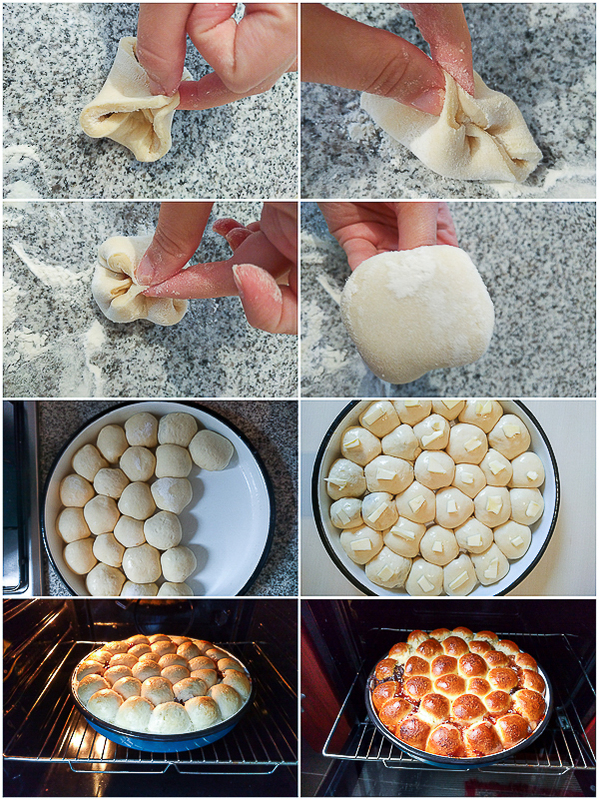 Keep working it with your hand until you get one smooth, elastic dough ball. 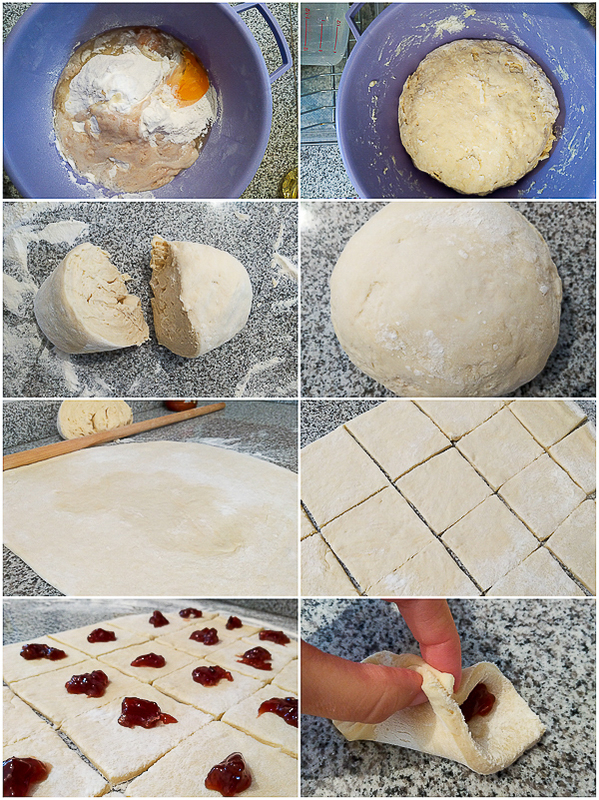 (If the dough is too sticky, add a little more flour. Alternatively, if the mixture feels too dry, add a little more milk.) Cover the bowl with a kitchen towel and set aside in a warm place for about 30-40 minutes or until the dough doubles in size. Dust working space with flour. Take the dough out and cut in half. Take one half and work it with your hands another 5-10 minutes, then spread it out into a rectangle (or as close as you can get to it) with a rolling pin. Cut vertically into 3 inch stripes and then perpendicularly until you get 3 inch squares. Place one teaspoon of marmalade in the middle of each square. Make each filled square into a small ball. Easiest way to do it is to pinch opposite corners of the square, and do that for all four sides, twice (look at the photos). Alternatively, you can roll the square into a ball after placing the marmalade inside. Place each ball into an oiled pan (the one used was 12 inch in diameter), keeping the pinched side down. Place the balls next to each other starting on the sides of the pan towards the middle until you fill the pan. Heat oven to 390F. Mix one egg and paint each ball with it, and top with a tiny slice of butter. Leave aside for 20-30 minutes so they rise a little bit. Heat oven to 390F. Bake for 10 minutes, then turn the pan around 90degrees. Bake for another 10-12 minutes or so. 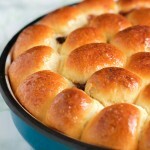 Be mindful as in the last few minutes as the rolls may start to blush faster due to the egg and butter on top. If they’re blushing too much, cover them with foil and add a few minutes to baking. 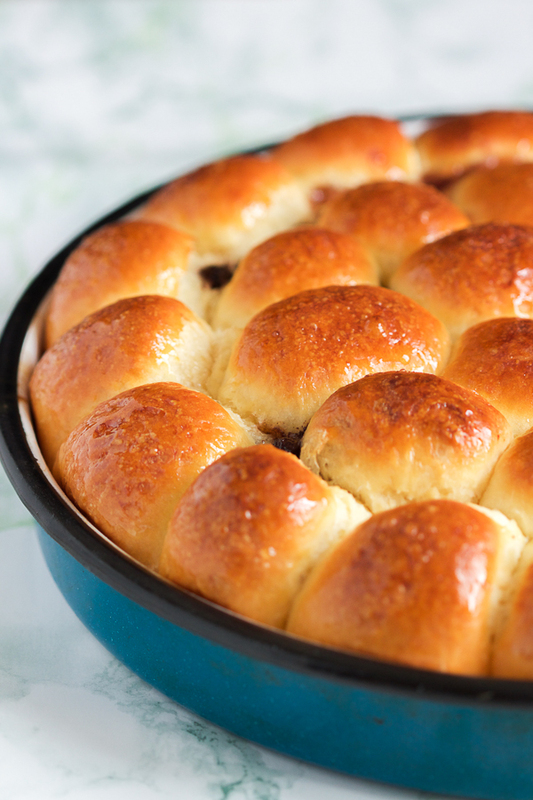 Consume rolls while hot or warm along with some tea. They are not tasty if left overnight. 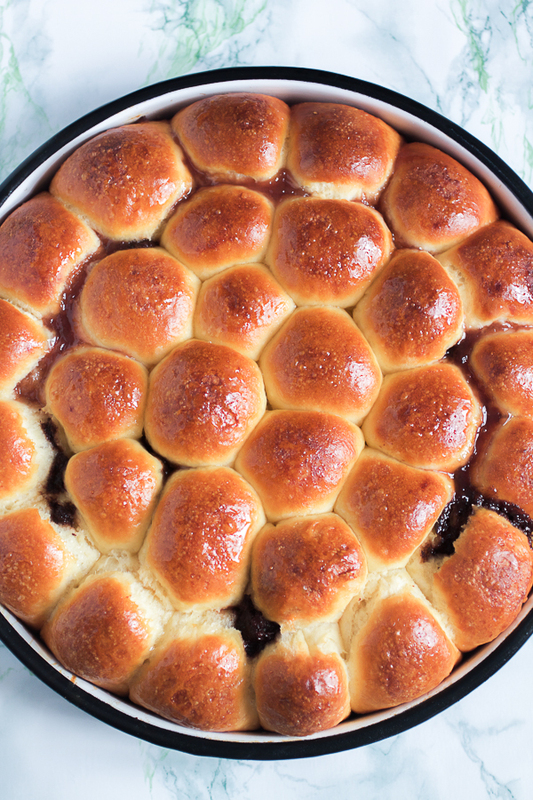 This is such a beautiful roll and I bet it’s delicious. Love the process pics! Even though I won’t be able to eat them … I’m going to treat my husband and babe with these 🙂 Hope mine turn out as nice as yours. Did you make them? How did they turn out?